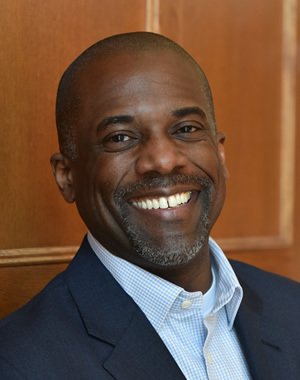 Hardy Vieux (MPP/JD '97) is a Towsley Foundation Policymaker in Residence at the Ford School in Winter 2018. Vieux is the legal director of Human Rights First, an independent advocacy and action organization that uses American influence to protect human rights and the rule of law. Previously, Vieux served as a policy fellow in the Middle East, where he worked at Save the Children International in Amman, Jordan. Prior to living in the Middle East, he was in private legal practice in Washington, D.C., for over ten years. While in private practice, Vieux also handled numerous pro bono matters, ranging from litigation stemming from the abuses at the Abu Ghraib prison in Iraq to juvenile detention impact litigation and asylum representation. In 2010, the D.C. Bar recognized him as its Pro Bono Lawyer of the Year. Vieux serves on the board of directors of the National Military of Justice and the board of visitors of Duke University's Sanford School of Public Policy. Vieux is a 1997 graduate of the U-M Law School-serving as editor-in-chief of the Michigan Journal of Race & Law-and Ford School of Public Policy, where he earned his law and Master of Public Policy degrees.